The 505th Parachute Infantry Regiment of the US 82nd Airborne Division were based in Quorn during the later part of the Second World War. 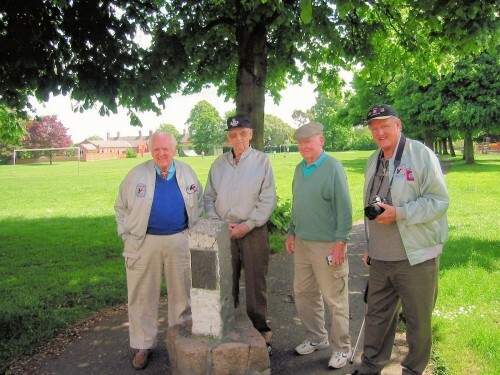 Many veterans have returned to Quorn over the years and despite all being over 80, six former paratroopers visited Quorn once more in 2006. This photo shows Bob Murphy on the left and Bill Sullivan in the green jumper. On the far right is the son of one of the veterans. Bob Murphy was underage when he joined up, and was in 'A' Company, a Pathfinder and 'featured' in the book and film 'The Longest Day'. After the war he was an Attorney in Boston & President of 82nd Airborne Association. He had a street named after him in St Mere Eglise, Normandy - 'Rue Bob Murphy' on the Southside of the church square. Bob died in Feb 2009.